A move to Wellington made Wiremu (Woody) stumble onto the awesomeness that is WIT. Since being in Wellington he has drunk and sunk, moved and grooved, hung and sung, jived and dived with some of the best improvisors this side of the Milk Way. 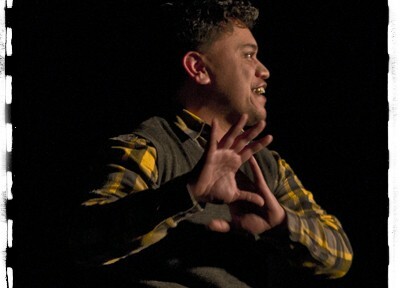 Theorising that one could improvise within his own lifetime, Wiremu (Woody) Tuhiwai stepped into the Quantum Leap accelerator and improvises . . . He improvises to find himself trapped in the past, facing mirror images that were not his own, and driven by an unknown force to change scenes for the better. His only guide on this journey is another improvisor, a partner from his own time, who appears in the form of another actor that only Wiremu can see and hear. And so Wiremu finds himself improvising from life to life, striving to put right what once went wrong, and hoping each time that the next scene will be the scene home . . . He is also Creative Director of WIT, which makes perfect sense to anyone who knows him.